Custom designed 1 inch tub outlet straight fitting. Made with high quality impact resistant virgin plastic. Incorporates tapered end to help guide the hose onto the four barb securing point. This fitting includes Viton gaskets. 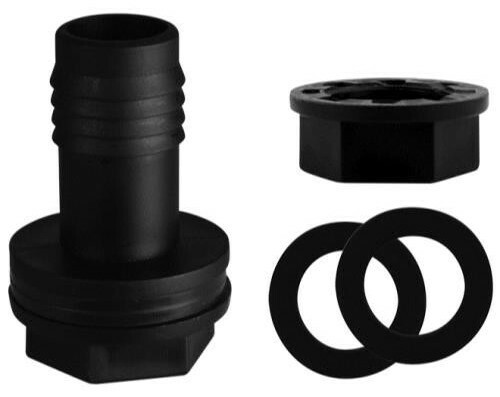 Viton is a material that stands up to the most abrasive chemicals and provides an exceptional seal. 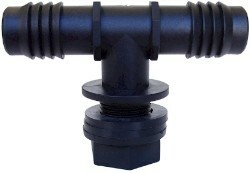 The fitting is secured by a custom nut that mounts from the inside of the container, making for a clean finished look. Eliminates the possibility of leaks. 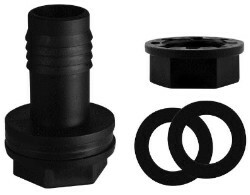 Hydro Flow Poly Tube Push-In Straight Fitting for both indoor and outdoor drip irrigation.